13 x 20 x 2 in. 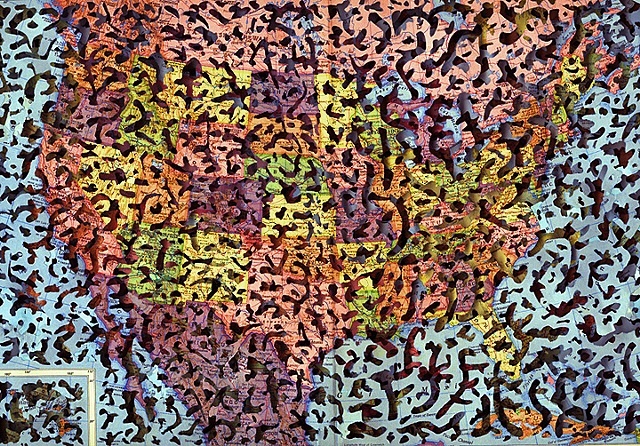 This piece appears to be a worm-eaten map of the United States and parts of North America. At a closer look, the viewer sees that below this surface is another ravaged continent and, barely visible below that, another, and so forth, including each of the major continents. Quarter-inch spacers separate the layers of disfigured continental maps, giving them a sense of depth as if they are relief maps or aerial views of some terrain on Google Maps.